Shorkie Puppy Mills and Scams Online. Genetic Health and AKC Dogs whatd does this all mean. ???? Shorkie Online Scams,and Shorkie Health Information For Shorkie Puppy Parents! Shorkie Puppies all over the internet today. Educate yourself. Even if you do not get a Shorkie from us please use our website to become informed when adopting a shorkie puppy online or in person. Information is POWER! There are many puppy mills and animal abusers ran by shorkie breeders. Below is an example. Please get the Shorkie Facts before you adopt! "Not All Dogs Are Breeding Quality"
One of the Most Important pages you can read!!!! 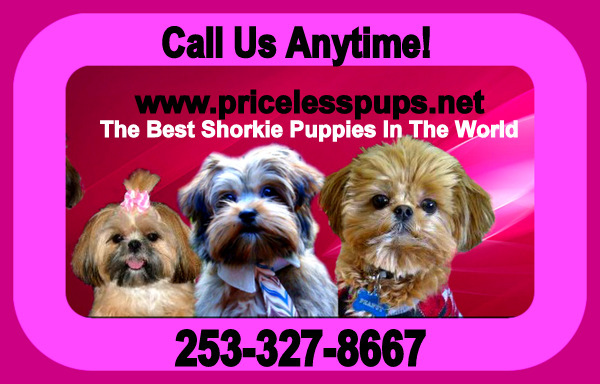 Priceless Pups "Creating healthy shorkie puppies one generation at a time!" We do Genetic Testing For All Our Adults and you are also covered in our lifetime health warranty and Money back buyers protection plan. Normally, two distinct sounds are heard when listening to the heart of a normal dog. These are often described as “lub” and “dub”. When listening with a stethoscope one hears: Lub-dub...Lub-dub....Lub-dub. Cherry Eye is not an eye disease and not covered in the warranty. Cherry Eye is a gland issue that surrounds the eye and can be caused by infection and or injury. But is is not an EYE issue but rather a gland third inner eye lid. Shorkies are not known for cherry eye. Our Adults and our puppies are tested for hearing using the Baer testing. (Descended Testicles on our Dads). Our males ( Our Yorkie daddies) are cleared for Cryptorchidism which is when one or both testicles fail to descend into the scrotum. Meaning both our daddies have both testicles descended and in place. In the event a puppy is born with an un-descended testicle that will be repaired by my vet at the time of Neuter at not additional cost to you other than the fee of the neuter. What Breeds/Ages Are Prone to Tracheal Collapse? The condition, which is genetic, primarily affects toy breeds of both sexes, with Yorkies by far the most commonly affected. Collapsing trachea can manifest at any age, though the average age when clinical signs begin to appear is six to seven years. Our adults have all been checked and tested for good working tracheas and have no signs of Tracheal Collapse. We have a yearly vet exam on each of our Dogs and many trips in between to ensure we are breeding the very best of the best for the families we service. But more importantly we want to know that our FUR KIDS are healthy because they are our family member and we love them that much. Does "AKC" mean a quality dog? Are Your shorkie puppies being bred from quality shih tzus and yorkies??? This is a breeder that WAS not allowed in the Shorkie Club Of America and has vowed to ruin us and the Shorkie Breed ever since. Here is a breeders that claims she has AKC dogs. Sherry Carter Folkland Alabama,She is a Shorkie Breeder that owns shorkie park.. Look at her dogs and the letter from her VET! She was ruled against in a court of law. Please be careful where you get your puppies from. The vet letter below and photo are what we received in court documents that anyone can access as "they are public record" from Marion County Alabama 205 921 4301. Sherry Carter was ruled against in the LAW SUIT . All Information is PUBLIC RECORD!!!! LOOK WHAT THE VET WROTE ABOUT SHERRY CARTER! She Burned the dogs eyes!!! The dog was brought to the vet emaciated. Starving to death and could not move! The vet did not think this poor baby would live! That does not happen over night. Sherry Carter is one of thousands of breeders that try and PLAY VET AT HOME INSTEAD of bringing the poor animal in for proper care. BUT THIS BREEDER BRAGS ABOUT AKC!!!!! that her dogs are AKC! PuppyPawler in Alabama that applied for a Shorkie Club of America Membership and was denied due to her breeding practices. We advise anyone interested in her puppies to Google her name Sherrry Carter aka Sherry Bowden Aka now Sherry Joiner.. she has had many aliases that she goes by. Shih tzus and Yorkies are being bred all over the world now and it has become quite the trend. But what makes a healthy shorkie puppy??? A lot of puppy ads and breeders alike proudly proclaim that their puppies are "AKC" puppies and they have been AKC breeders for years. Which is AWESOME our dogs are all AKC registered!!!!! but what dies AKC really mean. This is what puppy parents usually dont know. The initials "AKC" stand for American Kennel Club. The AKC is the leading breed registry in the United States of America. The assumption, often by uneducated and unsuspecting puppy parents is that if the puppy is an "AKC" puppy it must be of high quality and healthy. Genetic Testing for heart,kidney, liver hips and eyes.. how can they tell they are producing healthy shorkie puppies. HEART KIDNEY LIVER HIPS AND EYES! This is to ensure we are producing the healthiest babies possible. The procedures are costly but the best thing we can do for our Shorkie puppies and our puppy parents. Our shorkie breed registry, THE SHORKIE CLUB OF AMERICA provides a centralized location for maintaining records. A pedigree is the ancestry of a dog. Keeping good records of a shorkie puppies pedigree allows better understanding and tracking of both good and bad qualities that appear in the shorkie puppies we produce. In some cases the appearance of a genetic defect can be traced to a single dog. Often genetic defects do not appear until after the dog has matured. The ability to trace pedigrees with some accuracy allows a better basis for breeding decisions. With all that said.. There are very very responsible AKC breeders and Designer breeders available to help you no matter what type of puppy you are looking for. even if you do not get a priceless pups puppy..we are here to help you in any way we can. Hybrid Vigor: is it true? When you cross breed domestic dogs (Canis familiaris), you are within the same species; therefore, not creating a hybrid. So is it a THEORY OR FACT! Breeders of mixed breed and designer dogs have been using this for s few years now to sell their puppies. That's why we have never had it on our site. breeds of dogs they will be healthier. NOT TRUE! Many breeds carry the exact same health problems in their lineage. So the chance is just as high of health issues arising. Some of the problems in Shih tzus and Yorkies are common to both breeds such as Things such as Hip and Elbow Dysplasia, Luxating Patella's, various eye problems, von Willebrand's (a bleeding disorder)Liver and kidney problems, especially eye issues. Shih Tzu's and Yorkies are actually #1 and #2 breeds for the exact same eye issues. Rarely do people breeding crosses do any health tests – genetic or otherwise. They assume that an annual veterinarian visit and shots are all that is needed. Maybe for a pet dog, but breeders need to consider the genetic health of puppies produced. This is where many breeders do not take responsibility for the puppies they are producing. "We even take our puppies for eye cerf testing exams"
its just what we do to be responsible breeders. The myth that purebreds are unhealthy or nasty came about due to bad breeders who either did not care about health testing or who were ignorant and felt that dogs who show no outward signs of a problem do not have it. This is huge for puppy parents to understand . Let me repeat it one more time " bad breeders who either did not care about health testing or who were ignorant and felt that dogs who show no outward signs of a problem do not have it." Only proper genetic testing can prove if your dogs have issues or not. For purebred and mix breed breeders alike. If they have been breeding that long . Why haven't they done any of the testing? Better yet why wouldn't they want too? So, the next time you hear about hybrid vigor and how mixed breeds are healthier, remember this: hybrid vigor is a theory. The fact is any breeder breeding should care about the puppies to ensure to the best of their ability they are producing healthy puppies.. Breeders should have the proper genetic testing done to ensure puppy parents they are getting the best of the best.